Insomnia Cookies is adding a vegan and gluten-free chocolate chip cookie to its menu Wednesday, April 6. 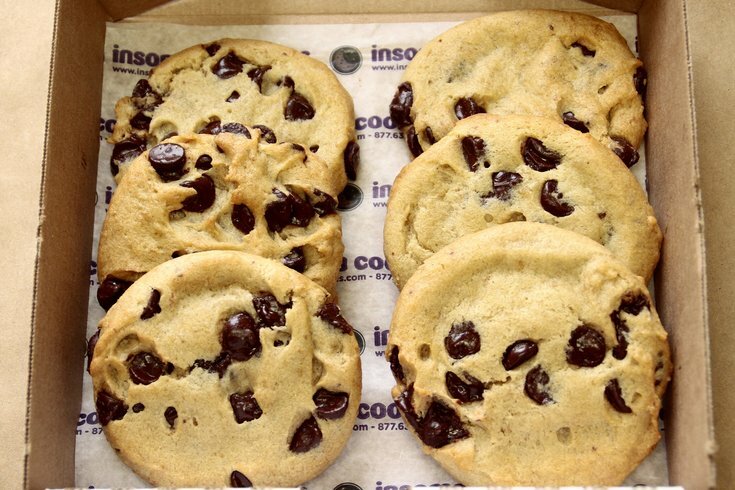 Insomnia Cookies, the late-night bakery founded in a University of Pennsylvania dorm room 13 years ago, is known for providing warm, gooey cookies to anyone with a serious craving for sweets. Their bakery trucks have been huge hits on Drexel University and Temple University campuses for some time now, thanks to their heavily trafficked locations near campus libraries. They're so successful, in fact, that Insomnia is relocating their truck bakeries to brick-and-mortars on each campus. The Drexel location will be at 3400 Lancaster Avenue and the Temple bakery will reside at the corner of Cecil B. Moore and Broad Street. Both bakeries will now serve Insomnia's full menu (a.k.a. ice cream, brownies, Cookiewiches etc.) and will serve customers from 11 a.m. to 3 a.m., with delivery starting at noon. Both locales are set to open this spring. Insomnia also recently announced that they'll be adding vegan/gluten-free chocolate chip cookies to their menu as of April 6. The new cookies will be available at all the Insomnia Cookies locations nationwide while supplies last.